Thomas Geve was born in 1929 in Stettin and grew up in Beuthen and Berlin. He was three years old when the Nazis came to power and experienced the growing persecution as he grew up. After the Jewish schools were closed in 1942, he worked amongst others at Weissensee Jewish cemetery as a gravedigger. In June 1943 he was deported with his mother to Auschwitz. In the camps he was in the bricklaying school and worked in construction squads and came close to death multiple times. He was to see his mother once more, inside the camps, kindling his hopes to be reunited with her, but she died in the camps. With the approaching Soviet troops, Thomas was evacuated westwards to other camps, first to Gross-Rosen, then to Buchenwald. After liberation, Thomas went to Switzerland to a place for orphaned Holocaust adolescents and after locating his father in the fall of 1945 moved to London to be reunited with him. There he finished high school and received an engineering degree in London. In 1950, Thomas moved to Israel, worked as an engineer, served as an officer in the army, married and had children, thereby helping to build the fledgling state. He lives today in Herzliya with children and grandchildren living around the country. Thomas was born on 27 October 1929 in Zullchow, a suburb of Stettin, a city which belonged to Germany at that time (now called Żelechowa, part of Szczecin, in Poland). Born on the Hebrew date of 23 Tishrei 5690, the date of the Jewish holiday of Simchat Torah (Rejoicing of the Torah), his Hebrew given name was Simcha (meaning “joy”). Thomas' paternal grandparents were Josef and Henriette Cohn. Their first child was a daughter called Irma born in 1894, and two years later came a son, Erich (Thomas’ father), who was born in 1896 in Beuthen. In the same year as their son’s birth, Josef and Henriette Cohn acquired a building on Beuthen’s market square (then in Germany, now Bytom in Poland). Between 1900 and 1926 the family owned a store for men's clothing and accessories located on their property, and in 1905 they bought and refurbished the adjacent corner house, on Krakauerstrasse 1, Beuthen. This is where the family probably lived after 1905. Grandmother Henriette died in 1927, and grandfather Josef died in 1930, shortly after the birth of Thomas. ​Thomas’ father Erich left home and went to study medicine at the University of Freiburg and as a student served briefly in the German army during World War I. Erich graduated in 1921, and worked in a number of places, including the Pathological Institute of the Hospital of Friedrichshain Berlin, the Institute for Physiology of Breslau University, the clinic for Internal Diseases of Freiburg University and the surgical clinic of the Jewish Hospital of Breslau. From 1926, at the age of 30, Thomas’ father took over the practice of Dr Julius Goetze in Stettin and became a General Practitioner. Thomas’ maternal grandparents were Julius and Hulda Goetze. Julius Goetze was born on 12 April 1871 and became a medical doctor. He had been a captain in the medical corps of the German Army, had fought in World War I and due to an injury caused by an explosion during that war he gradually started to go blind, meaning that he had to sell his medical practice. It was Thomas’ father Dr Erich Cohn who took it over. Thomas’ grandmother, Hulda Goetze, née Cohn, was born on 1875 in Znin, Poland. The couple had two daughters Bertha, born in 1906, and Ruth, born in 1912. Through the takeover of the medical practice, Thomas' father Erich met his wife, Thomas' mother, Bertha Goetze, who then became Bertha Cohn. In January 1933, when Thomas was three years old, the Nazis came to power. Soon afterwards, the medical establishment, such as the professional medical associations, began to discriminate against Jewish doctors. Furthermore, a decree was passed on 22 April 1933 excluding most Jewish doctors from participating in the state health insurance schemes, meaning that patients could not be reimbursed when visiting those Jewish doctors. Private health insurance companies also instituted discriminatory policies. As a result, Thomas’ father had to abandon his practice in Stettin. The family then moved to Thomas' father hometown of Beuthen in Upper Silesia. In Beuthen, the family returned to their property at Krakauerstrasse 1, and young Thomas went to the Jewish school, which his father before him had attended. He did not enjoy school much. More to his liking was the Zionist sports club Bar Kochba which he frequented. As a keen Zionist, Thomas' father performed free medical check-ups for Jews wishing to emigrate to Palestine (as they needed such a certificate to be able to emigrate), and provided over 100 such certificates. He became the second president of the Zionist organization in Beuthen. The family lived together with Thomas’ paternal aunt, Irma Cohn, who was a piano teacher. On 25 July 1938, a decree put an end to Jewish medical practice in Germany and the license of Jewish physicians was withdrawn on 30 September 1938, meaning that Thomas' father lost his right to practice medicine. On Kristalnacht on the night of 9-10 November 1938, widespread violence against Jews took place, the local synagogue was burned, some 70 Jewish shops were closed and hundreds of Beuthen Jews were arrested. After that, the Jewish school in Beuthen was closed and Thomas was sent by his parents for one month to a Jewish children's home at Obernick, near Breslau, in order to be further away from the trouble. At the end of 1938 the family moved to Berlin, where Thomas' maternal grandparents and Aunt Ruth had taken up residence, after leaving Stettin. Aunt Ruth, Ruth Seidler, née Goetze, had studied art and English, amongst others under Kathe Kollwitz, and was a teacher at the Jewish school at the Rykestrasse. Thanks to her, Thomas got enrolled as a pupil in that school, but Thomas often played truant, preferring to discover the city rather than sit in class. Thomas' father feared concentration camp, the general outlook was dire and the family therefore resolved to leave Germany. In order to increase their emigration chances, Thomas’ father took a course in cosmetics, learning to make beauty creams, and both parents took a chocolate-making course. Thomas’ parents applied far and wide, including to various countries in South America, but were turned down everywhere. Finally, Thomas’ father received political asylum in England, left Germany in the summer of 1939 and lived at at first at Kitchener camp in Richborough. Thomas’ mother also managed to get permission to emigrate to England as a domestic servant, but because there was no provision for little Thomas, she did not leave. Further emigration to England became subsequently difficult and Thomas and his mother were left stranded in Germany. Thomas went to live with his grandparents Goetze at Winterfeldtstrasse in Berlin, while his mother lived elsewhere in the city. In 1941 Thomas entered the Jewish middle school at the Grosse Hamburgerstrasse (which moved to Kaiserstrasse, then Lindenstrasse), but also here, Thomas often played truant and roamed the city. One day, Thomas even stumbled upon a Nazi parade and caught a glimpse of Hitler. From September 1941, Jews had to wear a Jewish star, and from October 1941 deportations "to the East" started from Berlin. Jewish schools were ordered closed by the end of July 1942, just one year after Thomas had started middle school, meaning that his formal education ended at the age of 12. After the closure of school, Thomas took a gardening job at the Jewish cemetery of Weissensee, which gave him a travel pass to travel through town. Thomas was still living with his grandparents, but on 19 March 1942, Thomas’ grandfather, Julius Goetze, died, and was buried at the Jewish cemetery at Weissensee. Around the same time, Thomas moved in with his mother at a small rented room at Speyerer strasse in Berlin. His grandmother, Hulda Goetze, was to be later deported aged 69, on 17 March 1943 to Theresienstadt along with many other elderly Jews. She died there of hunger or disease in 1944. Many deportations were then taking place, so the decision for Thomas to move in with his mother probably also meant to insure mother and son would be together in case they got deported. The room was two by three meters and part of a larger flat with other Jews. The apartment was the other side of town from the Weissensee cemetery. In the meantime, his mother got a job working from home as a seamstress making or mending German army uniforms. ​Thomas' mother then got a job working night shifts making coils for speedometers. As a result, Thomas who was working during the day in Weissensee spent lonely nights in their apartment in the Speyerer strasse. The room also just had one bed, so they slept in it in turns, Thomas during the night, his mother during the day. The situation generally was very dangerous. At one point, to hide from a wave of arrests, Thomas and his mother hid with a workmate of his mother, a certain Clara Bernhard living on Belzigerstrasse. She was a widow who had been married to a Jew. Also, because it was dangerous to be in touch with other people and to travel, there was only occasional contact with Aunt Ruth. She was to be deported on 12 March 1943 but Thomas and his mother did not know this at the time. At the end of February, the protections given to Jews working in factories and other Nazi-approved jobs largely ceased with the Fabrikaktion of 27 February 1943. Thomas and his mother were arrested at their flat in the Speyerer strasse and were brought by lorry to an improvised detention camp at the Grosse Hamburger Strasse. Once there, Thomas approached the only Jew on the appeals committee for releases, Martin Riesenburger, who came to fulfill the function of Rabbi. The two had met before at Weissensee cemetery and Thomas told him that he could work as a gravedigger at the cemetery. After a hearing with the commanding officer a few hours later, Thomas and his mother were released. They then went to the Jewish community office in Oranienburger strasse, where they had to convince the remaining Jewish officials to give them more definite exemption papers together with travel passes. Thomas then worked at Weissensee Jewish cemetery digging graves for for the remaining Berlin Jews that were dying or committed suicide, and burying Torah scrolls that were sent in from the whole of Germany. His mother went back to the factory she was working in. Thomas and his mother were renting a room and a half in a larger flat out of which the other Jews had been deported. The landlord as a result demanded from them the rent for the entire flat in the Speyerer strasse, a cost which they could not shoulder. As a result, Thomas and his mother were forced out of the flat. One of Thomas' female workmates, Eva-Ruth Lohde, who was considered a "Geltungsjude", offered Thomas and his mother a room at the flat she shared with her mother, Lotte Weile, at Konstanzer strasse 62, near the fashionable Kurfurstendamm. Thomas and his mother lived in the flat for a few months, but after Eva-Ruth and her mother were arrested, they were again left alone in the flat. As they would have been unable to afford the rent and had nowhere to go, they decided to hand themselves in for deportation in June 1943. They were deported on transport no. 39, which left Berlin on 28 June 1943 and arrived in Auschwitz on 29 June 1943. Upon arrival at Auschwitz, Thomas was separated from his mother and managed to pass the selection thanks to his height. As a result, he was assigned to remain in the camp to work, rather than being killed immediately. After being registered and tattooed, he spent his first night in Birkenau, whereafter he was transferred to the main camp of Auschwitz. Here he spent his first month in quarantine in Block IIa with the other new prisoners. At the end of the quarantine period, at the beginning of August 1943, Thomas and three youthful friends of his managed to enroll in the bricklaying school of Auschwitz, which took in youngsters like themselves. The school was located in Block7a which also contained many Gypsies. While there, another inmate smuggled in a message from his mother, who was at the women's camp in Birkenau. Thomas managed to meet his mother for 15 seconds the following week, before being chased away by the SS. He was never to see her again. After some months at the bricklaying school, Thomas joined a working squad that worked on building a women’s camp about an hour walking from the main camp. It was winter, and Thomas’ emaciated, underfed body could barely withstand the exhaustion. On two occasions Thomas was very sick and was lucky that there was place in the Auschwitz “hospital compound” of Block 28 which allowed to him to recover slightly. For work, Thomas was assigned to various working squads, helping enlarge amongst other the Union arms plant during the summer of 1944. Some of the building squads operated with civilian co-workers and were located with outside the main Auschwitz camp, allowing Thomas to become acquainted with the area around the camp. Thomas continued to live all the while in the block of the bricklaying school. On the evening of the 18 January 1945, with the Soviet troops approaching from the East, Thomas was evacuated from Auschwitz with all the other prisoners. Thomas had spent over 18 months in Auschwitz and was on the “death march” to the West. In his case, the march through the bitter cold took him and the other exhausted prisoners marching with him to Loslau (now Wodzisław Śląski in Poland), over 60 km away from Auschwitz. During the journey, prisoners often ate snow. The march had lasted 50 hours, with only four hours devoted to rest. At Loslau, the surviving prisoners were loaded onto freight trains and transported to Gross-Rosen concentration camp. Once the train arrived at Gross-Rosen, many prisoners did not get up from the train, but Thomas managed to trudge to the camp. At Gross-Rosen, the conditions were extremely difficult: sleeping was on the floor wherever one could find place and very little food. With Soviet troops close by, Thomas was taken again to the West by train at the end of January 1945. This time the transport was to the concentration camp of Buchenwald. Like in Auschwitz, after disinfection, the first few weeks were spent in quarantine. After that, Thomas was sent to a block of adults with a violent atmosphere amongst inmates. Sleeping was on bare wooden board packed so tight with other prisoners that one could not move. Work was also difficult and dangerous. After a number of weeks, Thomas managed to be transferred to live in the block of young people where conditions were somewhat better. In April 1945 allied troops were close to Buchenwald and the SS began evacuating Jews out of Buchenwald. The organized resistance within the camp handed Thomas the insignia of a German political prisoner to avoid his being forced to leave again. Nonetheless, Thomas only narrowly escaped being evacuated and was still in Buchenwald when the next day it was self-liberated by the inmates on 11 April 1945 as the remaining SS were fleeing. The following day US troops came marching through the gates of the camp. Greatly rejoiced by liberation, two years of camp life had left Thomas in frail physical health. In the two months following liberation, Thomas just left Buchenwald camp only three times. It was during this time that Thomas had made his drawings of his experiences during the camps. Meanwhile, Thomas considered his options and decided to go to Switzerland under the Red Cross auspices, amongst others because his native German was spoken there. 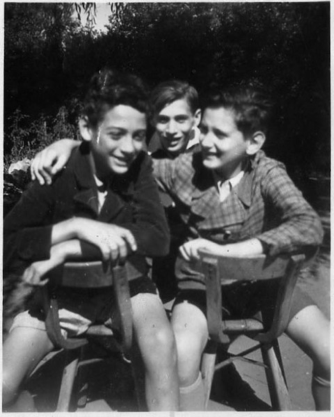 In June 1945, Thomas left Buchenwald and took the train to France, after which he and a group of youngsters like him continued on to Switzerland. At first Thomas was put in the Rheinfelden quarantine camp for a few weeks where he continued to recover, amongst others from skin ailments. After that, Thomas was transferred to a Red Cross home for teenage refugees in Zug (called the Institut Prealpine pour Jeunes Gens) where he spent the summer months. Thomas had been the whole time without news from his parents, but at the end of August 1945 his father was located in England. While the administrative formalities were sorted out, Thomas was taken in by a foster family in Rheinfelden and went to school there. In November 1945, he finally could board a plane to England to be reunited with his father. Reunited with his father, Thomas enrolled at age 16, for the first time in a proper school since the age of 10. He went to Burgess Hill school, where he stayed till the end of that school year and thus completed his secondary education. In January 1947, at the age of 17, Thomas then enrolled at Norwood Technical College in London in order to receive matriculation and start fulfilling his desire of becoming an engineer. Over the three summers of of 1946-1948, Thomas had volunteered at the Frating Hill Farm in Essex. Upon hearing of Israel’s independence, Thomas wanted to immediately leave to help fight for the newly independent country, but was persuaded by his father to first study for a degree. In September 1948, Thomas enrolled in Willesden Technical College in London. In the summer of 1949 Thomas also joined the local Zionist club where he met like-minded people, learnt a lot about Israel and started learning Hebrew. In January 1950, Thomas also was overjoyed at the birth of a baby sister, as his father had since remarried another German-Jewish refugee. While he was due to graduate in June 1950, he had decided that his future lay in Israel, even though he had formally already agreed to serve in the British army. Even though his father objected to the plan, Thomas decided to leave for Israel and said goodbye to his father a few days after his last exam at the college. His future lay in Israel. On 25 June 1950, Thomas left London for Paris, and from there took the train to Marseilles in order to meet the Jewish Agency there that could put him on a ship to Israel. In July 1950 he arrived at Haifa bay and was given a wooden hut to share in Bat Galim with 9 other newcomers. He was soon hired by a construction enterprise that sent him all around the country, where he helped build amongst others the settlements of Nurit, She’ar Yashuv and Kibbutz Lavi. After that, he became specialized in water tank construction. In the autumn of 1951, Thomas was drafted for two and a half years of military service in the IDF. He became a lieutenant charged mainly with engineering tasks. He was posted first in Yafo, then Qastina, then a year in Eilat, which back then was completely undeveloped. After the military service, he returned to the same construction enterprise for the years 1954-58 and he continued to work on construction projects around the north of the country. In 1956, he participated in the Sinai war and advanced with his unit to El-Arish. In 1958 Thomas published his book in Israel, Youth in Chains, while he continued to work as an engineer. From 1958 onwards, Thomas became an independent engineer, and was amongst others the town engineer of Bet Shean. In 1963 he married and had 3 children. Thomas spent most of his life living in Haifa and now lives in Herzliya. He has children and grandchildren living around Israel and frequently speaks to the media and lectures at schools and at Yad Vashem about his experiences during the Shoah.